Nature inspired: The form of the building capitalises on the natural terrain of the land. Property developer Emkay Group celebrated a new achievement with the opening of Bangunan Lestari Kumpulan Emkay (BLKE) in Cyberjaya — the first building in Malaysia accredited with the Leadership in Energy and Environmental Design (LEED) gold certification. LEED is an internationally recognised green building certification system developed by the US Green Building Council. It is a third-party certification programme and a widely accepted benchmark for the design, construction and operation of high-performance green buildings. The LEED green building rating features four levels of certification — Platinum, Gold, Silver and Certification. The BLKE, which was launched by former prime minister Tun Dr Mahathir Mohamad, will be occupied by Shell Business Service Centre Sdn Bhd under a 10+five-year lease agreement. Emkay Group director Fazwinna Mustapha Kamal said the BLKE marks the group’s move from low-cost development to high-end development with Grade A buildings purpose built green building. Joyful Gateway Sdn Bhd project coordinator R. Balasundram highlighted that the building was designed to conserve energy and natural resources, provide for a healthier and safe environment, improve the quality of human life, and increase the productivity of its occupants. “The LEED rating system is based on six design categories — sustainable sites, water efficiency, energy and atmosphere, materials and resources, indoor environmental quality, and innovation in design,” he said. The BLKE was developed by Emkay subsidiary Joyful Gateway, a joint venture company between MKN Embassy Development Sdn Bhd and partner Lucky Cottage Sdn Bhd. 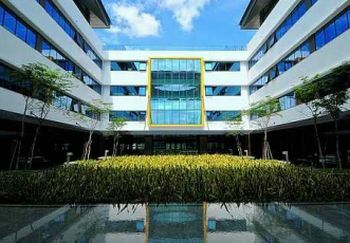 Construction of the building located at Jalan Teknokrat 3, Cyberjaya, commenced in October 2009 and was completed within 12 months. Its gross development value is approximately RM255mil, with an average yield of more than seven per cent per annum over its 10-year lease period. The BLKE houses five levels of office space and three levels of sub-basement car parks. In addition to the nett lettable area of 337,000 sq ft, there is a provision for additional office space of 23,000 sq ft on the fourth floor. The form of the building capitalises on the natural terrain of the land, which slopes down the back, allowing the sub-basement car park levels to be naturally ventilated and minimising energy usage. Among the BLKE’s green features are use of materials with higher recyclable content and energy efficient equipment, enforcement of water efficiency strategy through a rainwater harvesting system, as well as control and management of the environment which was monitored during construction. Balasundram said: “Other key features include accessibility via public transport, a stormwater management plan, reducing the heat island effect by painting heat-reflective paint and having a roof garden, having high-efficiency flush and shower fixtures, maximising open space, providing dedicated recycling collection and storage area (during construction stage). Fazwinna said the Emkay group has a dedicated team of consultants, contractors, engineers, suppliers and other technical staff to focus on Purpose Built Green Building projects. “A lot of development is heading towards green development now due to factors like social responsibility in protecting the environment, and for economic reasons like saving energy cost,” she said. “We are adapting green features into projects under MK Land Holdings, and the BLKE will serve as a benchmark for us to move forward towards a greater and greener group. Setia Haruman Sdn Bhd chief operating officer Lao Chok Keang, whose company is the master developer of Cyberjaya, noted that more multinational corporations require Green Buildings or green features incorporated into their building premises. “It is easy to develop green technology so long as one adheres to keeping the construction site neat, ensuring proper garbage disposal methods, educating the construction workers, and employing other proper safe and effective construction method,” said Fazwinna. PETALING JAYA: Households applied for less money to buy houses in February with applications falling to RM10.26bil in February from RM12.56bil in January, but the amount applied for was 23% higher than in February 2010. For the fourth consecutive month, ever since new loan-to-value (LTV) rules for the third or more house was enforced in November last year, households have applied for less money to buy residential property, data from Bank Negara’s monthly statistical bulletin showed. Analysts have said that the decline in the first couple of months might be seasonal and believe data from March onwards would accurately display the effect from the LTV rule. In a statement, Bank Negara said that interbank rates were stable in February. In terms of retail rates, the average base lending rate (BLR) of commercial banks was unchanged at 6.27% as at the end of the month. Retail deposit rates were also stable. It said broad money (M3) expanded at a more moderate annual rate of 7.9% in February. “During the month, the expansionary effects of higher credit extension by the banking system to the private sector and net foreign inflows were offset by the fund raising activities of the Government,” it said in the statement. Meanwhile, narrow money (M1) also expanded at a more moderate pace in February due to the return of currency to the banking system after the Chinese New Year festivities. Net financing to the private sector increased by RM13.4bil in February on a month-on-month basis, driven by higher PDS issuances. “PDS issuances rose due to several large issuances mainly for refinancing and working capital,” said the central bank. Sunway Real Estate Investment Trust (Sunway REIT) has bought The Putra Place in a public auction for RM513.95 million, confirming a Business Times report yesterday. Sunway REIT said the deal will provide geographical diversification and enlarge its portfolio of properties. Sunway REIT Management Sdn Bhd, the manager for Sunway REIT, is planning a major renovation of the property under a turnaround exercise. "Upon completion of this turnaround exercise, the manager believes that the property will enjoy upside on capital appreciation as well as improved yield," it said.